Samantha has been the Wag Pack Leader since April 2011. She came to us with a lifetime of experience working with dogs and cats from volunteering throughout her childhood to her previous role as Dog Daycare Manager at a kennel in Raleigh, NC. Samantha is also a Certified Animal Behaviorist. In addition to this experience, her diverse background also includes a former reign as Miss Algonquin in her hometown of Algonquin, IL, a Massage Therapy Certification, and time spent as a competitive weight lifter where she could squat 450 pounds! When she’s not at the Wag Factory, you’re likely to find Samantha outside biking, fishing, gardening, or working with her 4 dogs: Bumpkin (Australian Shepard), Gunther (Yorkie), BB and Bug (Pit Bulls). She also has 4 cats. Samantha and her husband Chris, an Executive Sous Chef, also enjoy dining out. Sam enjoys interacting with our clients and loves getting to know their dogs. She welcomes you to contact her personally with any questions and/or comments at samantha@wagfactory.com. Ryan and Missy Reed each grew up with a passion and love for dogs. Moving to James Island from Indianapolis, IN in 2007, they immediately realized the need for a good dog kennel in the area. In January 2009, research and planning for this business went into overdrive as the seemingly perfect location was up for rent. Ryan and Missy felt the timing was right to introduce James Island to the “all-inclusive” kennel concept. 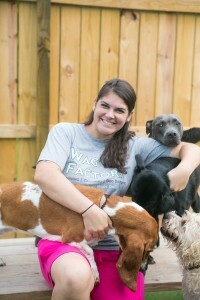 On June 6, 2009 the Wag Factory opened its doors as the first and only dog care facility on James Island offering boarding, grooming, and doggie daycare services. Thanks to the local community and tourists visiting the area, the Wag Factory’s popularity quickly grew. In 2010, we were awarded the highly coveted Best Of Charleston for our Doggie Daycare, voted on by the readers of the Charleston City Paper. By 2013 our facility at 832 Folly Road could no longer support the volume of dogs we were privileged to service on a regular basis so we moved down the street to a facility 3 times bigger at 719 Folly Road on July 1, 2013. A special THANK YOU to all current, former, and future customers that have made the Wag Factory what it is today! Copyright © 2019 Wag Factory. All Rights Reserved.